The Order of the Red Eagle (German: Roter Adlerorden) was an order of chivalry of the Kingdom of Prussia. It was awarded to both military personnel and civilians, to recognize valor in combat, excellence in military leadership, long and faithful service to the kingdom, or other achievements. As with most German (and most other European) orders, the Order of the Red Eagle could only be awarded to commissioned officers or civilians of approximately equivalent status. However, there was a medal of the order, which could be awarded to non-commissioned officers and enlisted men, lower ranking civil servants and other civilians. The predecessor to the Order of the Red Eagle was founded on November 17, 1705, by the Margrave Georg Wilhelm of Brandenburg-Bayreuth as the Ordre de la Sincerité. This soon fell into disuse but was revived in 1712 in Brandenburg-Bayreuth and again in 1734 in Brandenburg-Ansbach, where it first received the name of "Order of the Brandenburg Red Eagle". The statutes were changed in 1777 and the order named therein as the "Order of the Red Eagle". The order was conferred in one class, limited to fifty knights. The Kingdom of Prussia absorbed both Brandenburg-Bayreuth and Brandenburg-Ansbach in January 1792, and on June 12, 1792, King Frederick William II again revived the order as a Prussian royal order. After the Order of the Black Eagle, the Order of the Red Eagle was the second highest order of the kingdom in order of precedence. In 1810, King Frederick William III revised the statutes of the order, expanding it into three classes. In 1830, a breast star was authorized for the Second Class and the First Class General Honor Decoration became the Fourth Class of the order. The statutes were further revised in 1861, and a Grand Cross was established as the highest class of the order. By change to the statutes of the Order of the Black Eagle, every member of that order was automatically invested with the new Grand Cross of the Order of the Red Eagle, as well as with the Order of the Prussian Crown. By 1918, an affiliated soldier's medal had been made available to commoners and enlisted men. Following the Kaiser's abdication at the close of the First World War, a new German constitution was signed into law on August 11, 1919, effectively putting a legal end to the monarchy. All orders and decorations formally conferred by the monarchy ceased to exist, but recipients of the Order of the Red Eagle continued to wear it with their other decorations during the eras of the Weimar Republic, the Third Reich, and the restored republic. All classes but the Medal of the Red Eagle Order could be awarded with swords for distinction in wartime. The swords passed through the arms of the cross behind the center medallion. All classes above the 4th Class could be awarded with "Swords on Ring", indicating that the recipient of that class without swords had earlier received a lower class of the order with swords. A pair of crossed swords were worn above the cross on the suspension ring or above the medallion on the upper arm of the breast star. All classes could be awarded with or without crown as an added distinction. The Grand Cross, 1st and 2nd Class could be awarded with oak leaves, indicating prior receipt of the next lower class of the order, and/or with diamonds, as a special distinction. Royal family members (who were automatically awarded the Grand Cross of the Red Eagle Order, per statute of the Order of the Black Eagle) were awarded the Grand Cross "with crown." The Maltese cross badge was suspended from a miniature of the Prussian crown, which covered the usual suspension ring. The Grand Cross was awarded at least once with crossed marshals' batons, as was awarded to Paul von Hindenburg. The crossed batons were worn above the Maltese cross badge of the Grand Cross, on its suspension ring. The 3rd Class could be awarded with bow (Schleife), indicating prior receipt of the 4th Class. Prussians who were Knights of the Order of St. John of Malta who received the Order of the Red Eagle and who had cared for sick and wounded soldiers in the German wars of unification received the order with a miniature of the badge of the Order of St. John of Malta. For 50 years of service, a Red Eagle recipient received the "Jubilee Number" (Jubiläumszahl), a round medallion with the number "50" on it, affixed to the suspension ring or to the oak leaves or the ring of the bow, if applicable. There were also a set of special versions, the Stars 1st through 4th Class, for non-Christians. The badge of the order for the Grand Cross was a gold (gilt after 1916) Maltese Cross enameled in white, with red enameled eagles between the arms of the cross; the gold central disc bore the Royal monogram, surrounded by a blue enameled ring bearing the motto of the Order, Sincere et Constanter. The badge for the 1st to 3rd classes was a gold (gilt after 1916) cross pattée, enameled in white; that for the 4th class was similar but with smooth, plain silver arms. After 1879 the silver arms of the 4th class cross were pebbled in texture and appearance. The central disc bore the red eagle on a white enamel background on the obverse, with the royal cipher of King Friedrich Wilhelm surmounted by the Prussian crown on the reverse. The enlisted man's medal was of a relatively simple, round design, topped with the Prussian crown, with a depiction of the regular badge in the center of the medal on the obverse, with the royal cipher of the reigning monarch on the reverse. The breast star of the order was (for the Grand Cross) a golden eight-pointed star, (for 1st Class) a silver eight-pointed star, or (for 2nd Class) a silver four-pointed star with a white enameled cross pattée, all with straight rays. The central disc bore the red eagle on a white enamel background, surrounded by a ring (enameled blue for Grand Cross, white for the others) bearing the motto of the Order, Sincere et Constanter. After September 16, 1848, awards of all classes (except the medal) bestowed for military merit had two golden swords crossed through the central medallion. The traditional ribbon of the order was white with two orange stripes at the edges, but combat awards were frequently conferred with a black and white ribbon similar to that of the Iron Cross. Numerous variations of the ribbon existed, depending on the nature of the specific award. George William, Margrave of Brandenburg-Bayreuth (11/16/1678 – 12/18/1726), Sovereign of the Ordre de la Sincerité, from November 17, 1705; and from 1712 to 12/18/1726. Wilhelm II, King of Prussia & German Emperor (1859–1941), invested 1/27/1869; Sovereign from June 15, 1888 to November 28, 1918. The following lists show a fair cross section of individuals who were known to be conferred with the order in its several classes, in order of precedence. The Order of the Red Eagle was conferred frequently upon foreign nationals, both royal and non-royal, to honor their individual position or work and to further the diplomatic relations with their respective nations, in much the same way that the Order of the Bath is still conferred by the British monarchy. The following is only a partial list and may expand over time. GFM Albrecht Theodore Emil, Graf von Roon (1803–1879) – previous 3rd Class Knight, automatically awarded the Grand Cross in conjunction with being awarded with the Order of the Black Eagle, ca 1866, for service during the war with Austria, immediately after his success at the battle of Nikolsburg. Bernhard Freiherr von Bülow, Minister of Foreign Affairs, conferred, January 6, 1898, for his successes in advancing relations with China. St John Brodrick, British Secretary of State for War (1856–1942), invested in September 1902 when he visited Prussia for German Army maneuvers. Marcos Antônio de Araújo, Viscount of Itajubá. Ambassador of Emperor Dom Pedro II of Brazil to the King of Hanover and King of Prussia. Theodor von Holleben, German Ambassador to the United States; awarded 1st Class with oak leaves after the visit of Prince Henry of Prussia to the US, March 1902. Prince Mass'oud Mirza Zell-e Soltan (1850–1918), son of Naser al-Din Shah, King of Persia. Edward Villiers, 5th Earl of Clarendon (1846-1914), Lord-in-Waiting, in connection with the visit of Emperor Wilhelm II to the United Kingdom in late 1899. Lieutenant-General Sir Frederick Marshall, Colonel of the 1st Royal Dragoons, in connection with the visit of Emperor Wilhelm II to the United Kingdom in late 1899. Lieutenant-General Sir Thomas Kelly-Kenny (1840–1914), Adjutant-general of the British Forces, invested in September 1902 when he visited Prussia for German Army maneuvers. Lieutenant-General Sir John French (1852–1925), invested in September 1902 when he visited Prussia for German Army maneuvers. Vizeadmiral (Vice Admiral) and Admiral à la suite (honorary [full] Admiral) Bernhard Otto Curt von Prittwitz und Gaffron (1849–1922); veteran of the Austro-Prussian War and Franco-Prussian War, closely linked with Großadmiral (Grand Admiral) Prince Heinrich of Prussia, his frequent predecessor in various naval command stations. Baron Guenther Heinrich von Berg (1765–1843) Statesman, Doctor of Law, Judge, Legislator. Invested 28 June 1820. Admiral of the Fleet Sir John Jellicoe, 1st Earl Jellicoe of Great Britain (1859–1935), awarded the Order, 2nd Class, with swords, for actions in China during the Boxer Rebellion, where he served as a captain. Captain Edward Henry Bayly, Royal Navy, Captain of HMS Aurora, awarded the Order, 2nd class, with swords, for services in China during the Boxer Rebellion. His Princely Highness Pakubuwono X (1866–1939), the 10th Susuhunan, ruler of the past Surakarta (now in present Surakarta, Indonesia), awarded the Order, 2nd Class, with Star. Maj-Gen the Hon Edward James Montagu-Stuart-Wortley CB, CMG, DSO, MVO (1857–1934) of Great Britain's King's Royal Rifle Corps. Dudley Marjoribanks, 3rd Baron Tweedmouth (1874–1935), invested in September 1902 when he visited Prussia for German Army maneuvers. 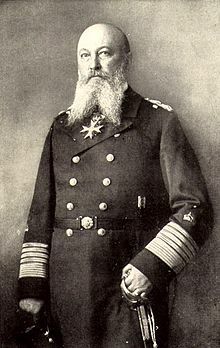 Captain Hans-Wilhelm von Dresky (later Rear Admiral) – awarded the Knight's Cross, 3rd Class, with swords and ribbon, for actions while in command of the cruiser SMS Habicht. Rittmeister (cavalry Captain) Manfred Albrecht Frhr von Richthofen (1892–1918) also known as "The Red Baron", awarded the 3rd Class, with Crown & Swords, for earning an unprecedented 70th aerial victory as Germany's top fighter ace of the Great War, April 6, 1918. This was one of only two such awards during the Great War for someone of company grade rank. Dr. Ernst Freiherr von Bibra 1854 (1806 – 1878) was a German Naturalist (Natural history scientist) and author. Ernst was a botanist, zoologist, metallurgist, chemist, geographer, travel writer, novelist, duellist, art collector and trailblazer in ethnopsychopharmacology. Handbuch über den Königlich Preußischen Hof und Staat für das Jahr 1918. (1918 Prussian State Handbook) Berlin, 1918. Treaty between France and Russia, Tilsit, July 7, 1807. ^ a b c Burke, Bernard (1858). The book of orders of knighthood and decorations of honour of all nations. London: Hurst and Blackett. pp. 200–202. ^ a b "The German Emperor´s birthday". The Times (36676). London. 28 January 1902. p. 3. ^ "Latest intelligence - Germany". The Times (36639). London. 16 December 1901. p. 6. ^ a b c d "Latest Intelligence - The German Army Maneuvres". The Times (36900). London. 16 October 1902. p. 4. ^ "Court Circular". The Times (36721). London. 21 March 1902. p. 8. ^ a b "Court Circular". The Times (36068). London. 17 February 1900. p. 11. ^ "Naval & Military intelligence". The Times (36773). London. 21 May 1902. p. 10. Wikimedia Commons has media related to Order of the Red Eagle.